The lower half of the plate is occupied by the shadow square and a half wind rose, with a scale of degrees and a geographical planisphere. A bar carrying two folding arms is fixed to the plate. A small compass used to be underneath the plate, but now only its housing remains. 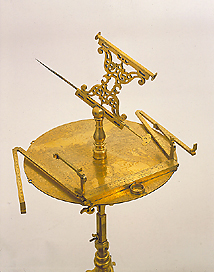 A small rotating column, attached by a pivot to the centre of the plate, bears a sliding needle surmounted by a sighting tube which can be adjusted, even in the vertical plane.